Most people use a tool called a “rammer” to pack down the sand. I’m not as sophisticated as that! I use an offcut of plywood. Initially, I tap down the sand by hand using the edge of the wood. 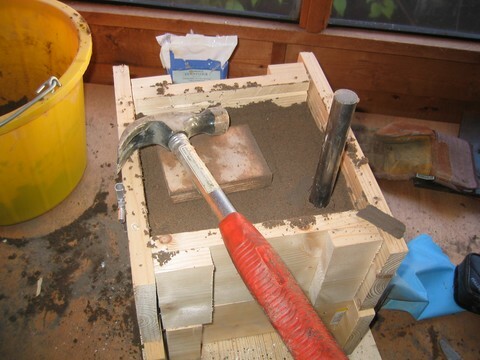 Then I put the wood flat on the surface of the sand, and tap with the hammer. This makes it really easy to pack down the sand, especially in the corners of the flask.